Most people enjoy a trip to the hairdresser, and it’s a bit of luxury that brightens up the day. But a trip to the hairdresser can take quite a chunk out of your day, and a salon visit can also turn out to be an expensive treat. You may also find that although the social side of a trip to the hairdresser is fun, sometimes you don’t want to sit around and watch other people have their hair attended to, you just want to get in, get done, and get out again! Why Choose a Mobile Hairdresser? Using a mobile hairdresser means that you can have your hair done at your own convenience and not have to fit the appointment around other people in a salon. It also means that you get the dedicated attention of your hairdresser, as we all know that a salon can be busy and often over booked – waiting around for your hairdresser to finish someone else’s cut and blow dry can be quite annoying if you’re in a hurry. Flexibility is part of the appeal of using a mobile hairdresser. Many mobile stylists work long hours and fit the work around the client – so if you can’t make it to a salon because you work long hours, you might be able to find a mobile hairdresser who will come and visit you in the evening.If you have children, a mobile hairdresser has a distinct advantage – you don’t need to drag them to a salon where they will undoubtedly be bored, or find a babysitter. If you find it hard to get to a hairdresser, the convenience of having someone just visit you when you need them is useful. 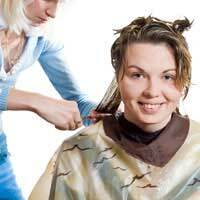 Mobile hairdressers usually carry out a full range of the services that you would expect from a salon hairdresser. Because the mobile hairdresser doesn’t usually have the same overheads as a salon based stylist, you will usually find that the services on offer are less expensive than you would pay in a high street salon. What Can a Mobile Hairdresser Offer? You should be able to get the same level of service from a mobile hairdresser as you would a salon. Most hairdressers that go it alone will have exactly the same level of training as a salon based stylist. Some stylists also offer beauty services so you could book a hair-do at the same time as a manicure or facial for example. What Should I Check For When Selecting a Mobile Hairdresser? With a salon you would naturally expect the staff to be qualified, and to be up to date on modern hairdressing techniques, but with a mobile, self employed stylist this isn’t guaranteed. When you’re choosing a stylist, ask them about where they trained, and what qualifications they have. Most reputable hairdressers will have an NVQ in Hairdressing – this is the only nationally recognised qualification for hairdressers. The NVQ is a three level qualification, with Level One covering basics such as shampooing and basic colours, through to Level Three which means the stylist is trained in creative hairdressing techniques and fashion styling. The main disadvantage of having the hairdresser visit you is the lack of ‘pampering’ – you may be expected to wash your own hair, it’s not very glamorous having your hair done in your own kitchen, and you’ll have to tidy up afterwards. If you enjoy the ‘me time’ you get when you go to the salon or the social side of it, then a mobile stylist probably won’t feel such a treat. But if you just want a chat with a friendly hairdresser while you get your hair styled, mobile could be the way to go!